Help us get boots on the ground! AFEF is fundraising for the rangers and eco-guards that protect the Central African rainforests and the elephants that call it home. AFEF’s first initiative is getting boots on the ground, literally. In our ‘Boots on the Ground’ project we have set ourselves a target to help 500 rangers and eco-guards across Central Africa who work tirelessly out in the field to protect forest elephants and their habitat. We aim to provide new high quality boots and five pairs of durable socks to 500 rangers across the Congo Basin. AFEF is the African Forest Elephant Foundation working to highlight the fast decline toward extinction of the largely forgotten Forest Elephants who unbeknown to the world are suffering the same and worse fate that their savannah cousins in Central Africa and aims to preserve their place, along with that of their forest habitat, into the future. The Earth’s forests have a vital and irreplaceable role in maintaining climate stability, producing the ozone which forms the protective barrier layer at the edge of the Earth’s atmosphere, which shields us from the radiation of the sun and allows all life, and human life itself, to exist. 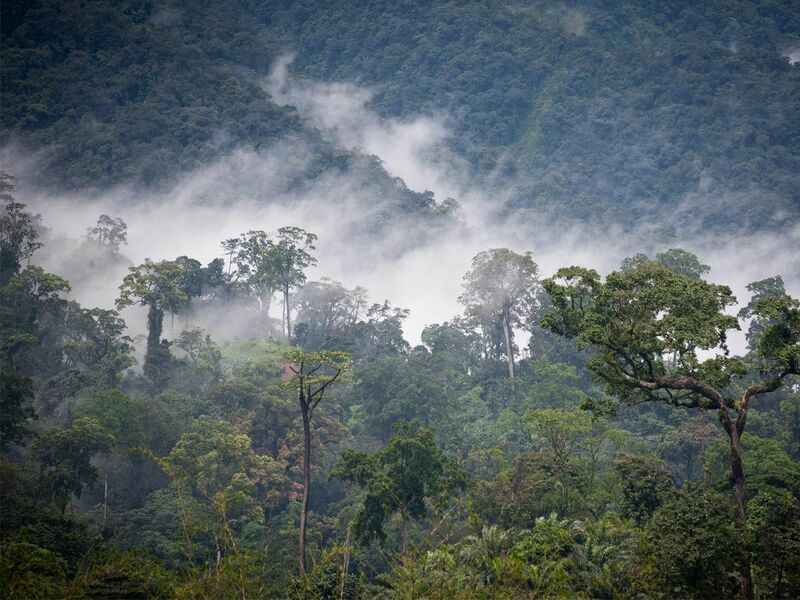 Tropical rainforests are pivotal factors in global weather patterns and generating the rainfall which sustains the animal and plant life upon which we all depend on to survive. The Congo Basin homes some of the largest undisturbed areas of tropical rainforest on the planet as well as large wetlands. The forest is home to over 400 mammal species, more than 1,000 bird species, and likely over 10,000 plant species of which around 3,000 can only be found in the Congo Basin. The forest also plays a momentous role globally acting as the planet’s second “lung”, with the diminishing Amazon being the other. The Congo Basin is a huge “carbon sink” trapping carbon that could otherwise become carbon dioxide, the main cause of global warming. The Congo Basin acts as an importance resource base for the livelihoods and well-being of tens of millions of people both in Africa and around the world. Why save the Forest Elephant? Elephants consume a huge amount of vegetation. As a result, every single elephant produces about one tonne of dung every single week – an excellent fertiliser enriching the soils of Africa and cultivating the ecosystems like the Congo Basin rainforest, of the most biologically profound on Earth. Elephants disperse more seeds of more species of trees and over greater distances than any other animal on this planet. The seeds of fruits or acacia pods that pass through the elephant undigested and are dispersed over large distances, resulting in elephants acquiring the unique status of ‘gardeners of the forest’. When forest elephants eat, they also create gaps, or ‘game paths’ in the dense forest. These paths allow new plants to grow and create pathways for other smaller animals to use. This is particularly important in the thick otherwise impenetrable forests in Central Africa. In the same way game paths are created, forest elephants create and maintain bais, which in turn provide water to other forest animals such as the western lowland gorillas and other endangered great ape species. All evidence supports recognition of forest elephants as a separate species altogether from Africa’s well-known savannah elephants. Forest elephants are being wiped out while the world ignores this distinction and the desire to save Africa’s elephants must include these elusive and lesser-known African Forest Elephants. Logging has increased significantly following the return of peace to the region. As a result, the sale of timber has now surpassed that of diamonds. A major cause of deforestation in the Congo Basin is as a result of local subsistence activities by farmers and villagers who rely on forestlands for agriculture and fuel wood. The sustainability of the forests and biodiversity in the Congo Basin are becoming threatened by an increase in mining activity. The oil and gas industry are present in various countries associated with the Congo Basin. As well as the risk of major oil spills occurring; general pollution, caused by the industry, is also considered a serious issue. Human activities pollute ecosystems around the world. Pollution (and chemical dumping) is likely to to have serious affects on the environment due to weak environmental protection and pollution controls, coupled with the increase in urbanisation and industrialisation. Poaching continues to decimate wildlife populations to supply an ever-growing international demand. The current ivory trade is heavily impacting Forest elephant populations causing their populations to plummet towards extinction. Wildlife is also an important resource for the livelihood of rural people in the forests due to it being a cheap and a high-quality food source. However, over-exploitation of wildlife for both local and commercial purposes is one of the most serious threats to wildlife and biodiversity in the African continent. Forest elephant decline is as a result of the combination of the rapid increase in demand for ivory in China and its ease of sale there, together with the lack of effective governance in Central Africa and the unprecedented access for poachers to the depths of the forests via unprotected roads, such roads a by-product of the timber industry, which itself results in elephant habitat destruction. The current distribution of forest elephants within the forests is heavily determined by human activities, even within isolated and apparently well-protected national parks. Humans are forcing forest elephants into increasingly smaller isolated areas meaning elephants cannot travel long distances, which is necessary for seed dispersal and physical impacts on the forest for the maintenance of biodiversity. What can you do to help!? Forest elephants – and the forest they help to maintain – are under imminent threat if the current trends of illegal killing and range restriction are not halted and reversed.